Which specialties of doctors treat insulin resistance? Is there a test for insulin resistance? Can insulin resistance be cured? Is there a special diet plan for treating insulin resistance? What foods help prevent type 2 diabetes? Can exercise totreat insulin resistance? What medications treat insulin resistance? Can insulin resistance be prevented? What is the prognosis for a person with insulin resistance? Insulin resistance precedes the development of type 2 diabetes (T2D). Insulin resistance is treated by lifestyle modifications and in some cases, medications. In some cases insulin resistance cannot be prevented, but modifiable risk factors include maintaining a healthy weight and getting regular exercise. Insulin is a hormone produced by the beta cells of the pancreas. These cells are scattered throughout the pancreas in small clusters known as the islets of Langerhans. The insulin produced is released into the blood stream and travels throughout the body. Insulin is an essential hormone that has many actions within the body. Most actions of insulin are directed at metabolism (control) of carbohydrates (sugars and starches), lipids (fats), and proteins. Insulin also regulates the functions of the body's cells, including their growth. Insulin is critical for the body's use of glucose as energy. Insulin resistance (IR) is a condition in which the body's cells become resistant to the effects of insulin. That is, the normal response to a given amount of insulin is reduced. As a result, higher levels of insulin are needed in order for insulin to have its proper effects, and the pancreas compensates by trying to produce more insulin. This resistance occurs in response to the body's own insulin (endogenous) or when insulin is administered by injection (exogenous). With insulin resistance, the pancreas produces more and more insulin until the pancreas can no longer produce sufficient insulin for the body's demands, and then blood sugar rises. Insulin resistance is a risk factor for development of diabetes and heart disease. The metabolic syndrome is a group of conditions involving excess weight (particularly around the waist), high blood pressure, and elevated levels of cholesterol and triglycerides in the blood. Type 2 diabetes mellitus (T2D) is the type of diabetes that occurs later in life or with obesity at any age. Insulin resistance precedes the development of type 2 diabetes, sometimes by years. In individuals who will ultimately develop type 2 diabetes, it has been shown that blood glucose and insulin levels are normal for many years, until at some point in time, insulin resistance develops. High insulin levels are often associated with central obesity, cholesterol abnormalities, and/or high blood pressure (hypertension). When these disease processes occur together, it is called the metabolic syndrome. One action of insulin is to cause the body's cells (particularly the muscle and fat cells) to remove and use glucose from the blood. This is one way by which insulin controls the level of glucose in blood. Insulin has this effect on the cells by binding to insulin receptors on the surface of the cells. You can think of it as insulin "knocking on the doors" of muscle and fat cells. The cells hear the knock, open up, and let glucose in to be used. With insulin resistance, the muscles don't hear the knock (they are resistant). So, the pancreas is notified it needs to make more insulin, which increases the level of insulin in the blood and causes a louder knock. The resistance of the cells continues to increase over time. As long as the pancreas is able to produce enough insulin to overcome this resistance, blood glucose levels remain normal. When the pancreas can no longer produce enough insulin, blood glucose levels begin to rise. Initially, this happens after meals - when glucose levels are at their highest and more insulin is needed - but eventually while fasting too (for example, upon waking in the morning). When blood sugar rises abnormally above certain levels, type 2 diabetes is present. The exact values for normal or high insulin levels vary according to the laboratory and the type of test performed. With insulin resistance, there is a high fasting insulin level and a normal to high fasting blood glucose level. High or elevated insulin levels can be seen with other medical conditions as well, including insulin-producing tumors (insulinomas), Cushing syndrome, and fructose or galactose intolerance. Type 2 Diabetes: Overt diabetes may be the first sign insulin resistance is present. Insulin resistance can be noted long before type 2 diabetes develops. Individuals reluctant or unable to see a health-care professional often seek medical attention when they have already developed type 2 diabetes and insulin resistance. Fatty liver: Fatty liver is strongly associated with insulin resistance. Accumulation of fat in the liver is a manifestation of the disordered control of lipids that occurs with insulin resistance. Fatty liver associated with insulin resistance may be mild or severe. Newer evidence suggests fatty liver may even lead to cirrhosis of the liver and, possibly, liver cancer. Skin Lesions: Skin lesions include increased skin tags and a condition called acanthosis nigerians (AN). Acanthosis nigricans is a darkening and thickening of the skin, especially in folds such as the neck, under the arms, and in the groin. This condition is directly related to the insulin resistance, though the exact mechanism is not clear. Acanthosis nigricans is a cosmetic condition strongly associated with insulin resistance in which the skin darkens and thickens in creased areas (for example, the neck, armpits, and groin). Skin tags occur more frequently in patients with insulin resistance. A skin tag is a common, benign condition where a bit of skin projects from the surrounding skin. 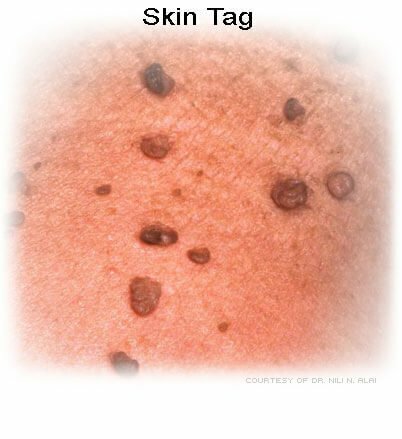 Skin tags vary significantly in appearance. 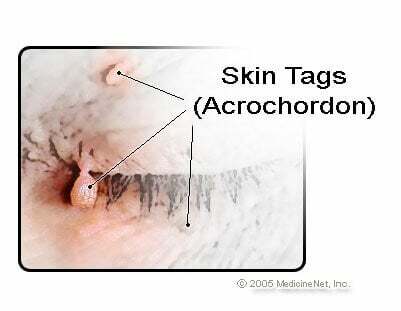 A skin tag may appear smooth or irregular, flesh-colored or darker than surrounding skin, and either be simply raised above surrounding skin or attached by a stalk (peduncle) so that it hangs from the skin. Polycystic ovary syndrome (PCOS): Polycystic ovary syndrome is a common hormonal problem which affects menstruating women. It is associated with irregular periods or no periods at all (amenorrhea), obesity, and increased body hair in a male pattern of distribution (called hirsutism; for example, moustache, sideburns, beard, mid-chest, and central belly hair). Hyperandrogenism: With PCOS, the ovaries can produce high levels of the hormone testosterone. This high testosterone level can be seen with insulin resistance and may play a role in causing PCOS. Why this association occurs is unclear, but it appears the insulin resistance somehow causes abnormal ovarian hormone production. Growth abnormalities: High levels of circulating insulin can affect growth. While insulin's effects on glucose metabolism may be impaired, its effects on other mechanisms may remain intact (or at least less impaired). Insulin is an anabolic hormone which promotes growth. Patients may actually grow larger with a noticeable coarsening of features. Children with open growth plates in their bones may actually grow faster than their peers. However, neither children nor adults with insulin resistance become taller than predicted by their familial growth pattern. Indeed, most adults simply appear larger with coarser features. The increased incidence of skin tags mentioned earlier may occur through this mechanism too. Is overweight with a body mass index (BMI) more than 25 kg/m2. You can calculate your BMI by taking your weight (in kilograms) and dividing twice by your height (in meters). Management of insulin resistance is through lifestyle changes (such as diet, exercise, and disease prevention) and medications. Insulin resistance can be managed in two ways. First, the need for insulin can be reduced. Second, the sensitivity of cells to the action of insulin can be increased. The need for insulin can be reduced by altering the diet, particularly the carbohydrates in the diet. Carbohydrates are absorbed into the body as they are broken up into their component sugars. Some carbohydrates break and absorb faster than others; these are referred to having a high glycemic index. These carbohydrates increase the blood glucose level more rapidly and require the secretion of more insulin to control the level of glucose in the blood. Non-starchy vegetables (such as broccoli, green beans, asparagus, carrots, and greens). These are low in calories and in total carbohydrates, and contain vitamins and fiber. Since foods are rarely eaten in isolation, it can be argued that the glycemic index of each food is less important than the overall profile of the whole meal and associated drinks. Fat-free or low-fat dairy products to provide calcium and strengthen bones. Full-fat dairy products should be avoided as high-fat foods can worsen insulin resistance. Several studies have confirmed that weight loss - and even aerobic exercise without weight loss - increases the rate at which glucose is taken from the blood by muscle cells as a result of improved sensitivity. Diet and exercise have been shown to reduce the development of type 2 diabetes in multiple studies and can reduce insulin resistance. Metformin (Glucophage) is a medication used for treating type 2 diabetes. It exerts two actions that help control blood glucose levels. Metformin prevents the liver from releasing glucose into the blood, and it increases the sensitivity of muscle and fat cells to insulin, allowing them to remove more glucose from the blood. By these actions, metformin lowers blood insulin levels because lower blood sugar levels tell the pancreas to put out less insulin. Metformin is a reasonably safe medication when used in the proper population. Although occasionally associated with gastrointestinal side effects, metformin is usually well tolerated. While there are no FDA-approved drugs to prevent type 2 diabetes or to treat pre-type 2 diabetes (insulin resistance), the American Diabetes Association has recommended that metformin be the only drug considered for the prevention of type 2 diabetes. Insulin resistance cannot always be prevented, but there are ways to modify risk factors, such as keeping a healthy weight and getting regular exercise. Insulin resistance is associated with the development of type 2 diabetes unless measures are taken to reverse the insulin resistance. Weight loss, eating a healthy diet, not smoking, and exercise, as described previously, can all help reverse insulin resistance. Awareness of insulin resistance has gained significance, in its own right, as a contributor to the metabolic syndrome. Timely intervention can delay the onset of overt type 2 diabetes. Future studies must assess longer intervals than research to date in order to determine the duration for treatment to prevent the development of type 2 diabetes and related complications. Lifestyle changes (in nutrition and physical activity) are clearly important to delay the development of type 2 diabetes in individuals with insulin resistance and are the primary recommendation for prevention of diabetes in high-risk individuals. Metformin is the only drug recommended by guidelines, for those patients at highest risk. Education about these changes must be directed to all groups at risk for type 2 diabetes. Childhood obesity is epidemic and on the rise in the developed countries. Changes must be made in homes and school cafeterias to ensure healthier nutrition. National Diabetes Information Clearinghouse (NDIC). "Diabetes Prevention Program (DPP)." Updated: Jul 18, 2017. National Diabetes Information Clearinghouse (NDIC). "Prediabetes and Insulin Resistance." August 2009. Olatunbosun, S.T., MD. "Insulin Resistance." Medscape. Updated: Sep 18, 2017.